North Korean leader Kim Jong Un has vowed to shut down the country's nuclear test site in May and open the process to experts and journalists from South Korea and the United States, Seoul's presidential office said Sunday. The event may serve as a dramatic setup to Kim's crucial nuclear negotiations with President Donald Trump that may take place in the next few weeks amid widespread skepticism on whether the North will ever fully surrender its nuclear weapons. Kim made the comments during his summit with South Korean President Moon Jae-in on Friday at a border truce village, where he also expressed optimism about his meeting with Trump, saying the U.S. president will learn he's "not a person" to fire missiles toward the United States, Moon's spokesman Yoon Young-chan said. 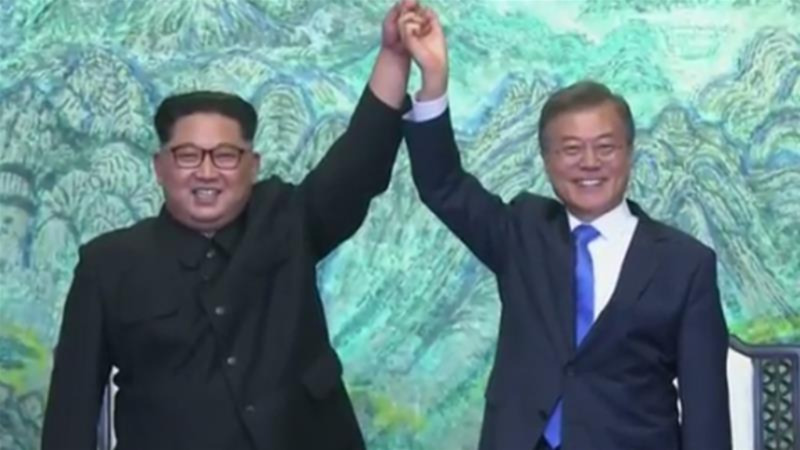 Moon and Kim during the summit promised to work toward the "complete denuclearization" of the Korean Peninsula, but made no references to verification or timetables. 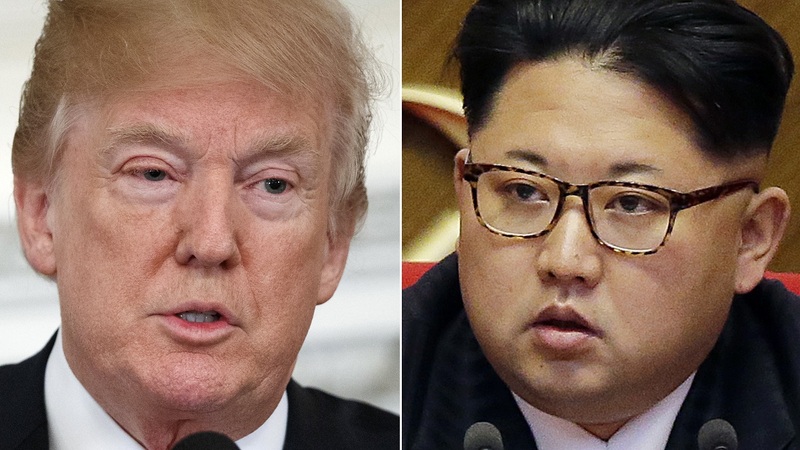 Seoul had also shuttled between Pyongyang and Washington to set up a potential meeting between Kim and Trump, which is expected next month or early June. "Once we start talking, the United States will know that I am not a person to launch nuclear weapons at South Korea, the Pacific or the United States," Yoon quoted Kim as saying. "If we maintain frequent meetings and build trust with the United States and receive promises for an end to the war and a non-aggression treaty, then why would we need to live in difficulty by keeping our nuclear weapons?" Yoon quoted Kim as saying. Kim reacted to skepticism that the North would only be closing down the northernmost test tunnel at the site in Punggye-ri, which some analysts say became too unstable to conduct further underground detonations following the country's sixth and most powerful nuclear test in September. In his conversation with Moon, Kim denied that he would be merely clearing out damaged goods, saying that the site also has two new tunnels that are larger than previous testing facilities, Yoon said. The Friday summit between Moon and Kim kicked off a global diplomatic drive to deal with the North's nuclear and missile threats, which after a flurry of weapons tests last year involve purported thermonuclear weapons, developmental ICBMs and quick-fire solid-fuel missiles. While the meeting ended with no new concrete measures on the nuclear standoff, the more substantial discussions on the North's denuclearization — including what, when and how it would occur — were always going to be reserved for a Kim-Trump summit. Seoul has said Kim expressed genuine interest in dealing away his nuclear weapons. 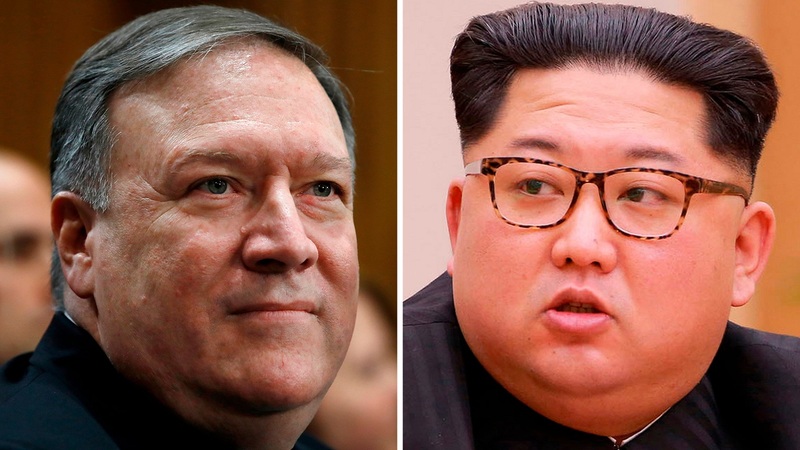 But North Korea for decades has been pushing a concept of "denuclearization" that bears no resemblance to the American definition, vowing to pursue nuclear development unless Washington removes its troops from the Korean Peninsula and the nuclear umbrella defending South Korea and Japan. There is widespread doubt whether Kim will ever agree to entirely abandon his nuclear weapons when he clearly sees them as providing his only guarantee of survival in a region surrounded by enemies. Some analysts see Moon's agreement with Kim at Friday's summit as a disappointment, citing the lack of references to verification and time frames and also the absence of a definition on what would constitute as a "complete" denuclearization of the peninsula. 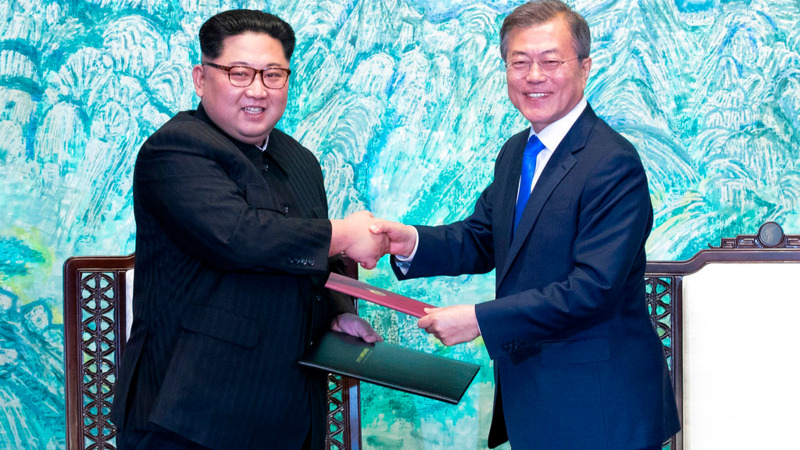 But Patrick McEachern, a former State Department analyst currently with the Washington-based Wilson Center, said it was still meaningful that Moon extracted a commitment from Kim to complete denuclearization, which marked a significant change from Kim's previous public demand to expand his nuclear arsenal quantitatively and qualitatively. "The two leaders established a framework for plausible resolution of the most pressing issues on the peninsula, credibly agreed to further leader-level discussions, and frankly recognized the devil will be in the details of implementation," he said. "This is a great start and should be cause for cautious optimism," McEachern said. "The public conversation should now shift from speculation on whether North Korea would consider denuclearization to how South Korea and the United States can advance this denuclearization pledge in concrete steps in light of North Korea's reciprocal demands for concrete steps toward an eventual peace agreement." Moon over the weekend briefed Trump and Japanese Prime Minister Shinzo Abe on his talks with Kim. Moon told Abe he conveyed Japan's desire to normalize ties with North Korea after resolving issues on "past history." Kim replied that he's willing to negotiate with Japan, Moon's office said. The office didn't provide details but Abe reportedly said that Moon did raise the North's abduction of Japanese citizens during his meeting with Kim. Japan says North Korea abducted at least 17 Japanese citizens in the 1970s and 1980s to train its agents in Japanese language and culture in order to spy on South Korea. North Korea has acknowledged abducting 13 Japanese in the 1970s. It allowed five of them to visit Japan in 2002 and they stayed. North Korea says eight others have died, but their families say the North's statement cannot be trusted. Yoon said Kim also revealed plans to re-adjust its current time zone to match the South's. The Koreas used the same time zone for decades before the North in 2015 created its own "Pyongyang Time" by setting the clock 30 minutes behind South Korea and Japan. North Korean then explained the decision as an effort to remove a legacy of Japanese colonial rule. Local time in South Korea and Japan is the same — nine hours ahead of Greenwich Mean Time. It was set during Japan's rule over the Korean Peninsula from 1910 to 1945. Yoon said that the North's decision to return to the Seoul time zone was aimed at facilitating communication with South Korea and also the United States.